Inspired by Vintage - My name is Jeanne. I am an artist & antique lover creating pretty things in my vintage beachside home in White Rock, Canada. Follow Me On Social Media, or Sign Up for My Newsletter to be the first to find out about my latest creations and vintage finds. The Jitterbug was a dance invented in underground jazz clubs in the 1930's & involved all manner of inspired improvisation leaving you feeling free and uninhibited. I often feel like a Jitterbug... inspired in many creative directions & rarely sitting still. 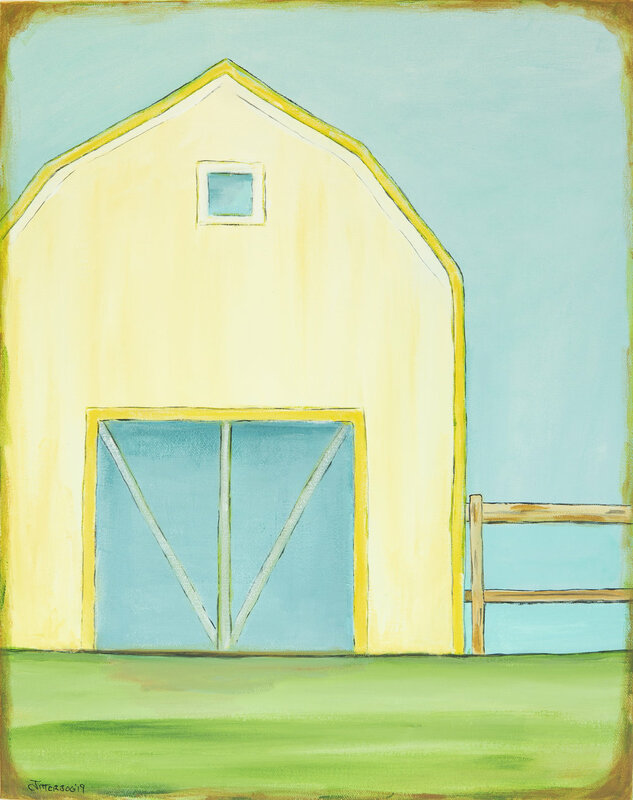 My latest paintings are inspired by life in the Pacific Northwest and simple scenes of country life. 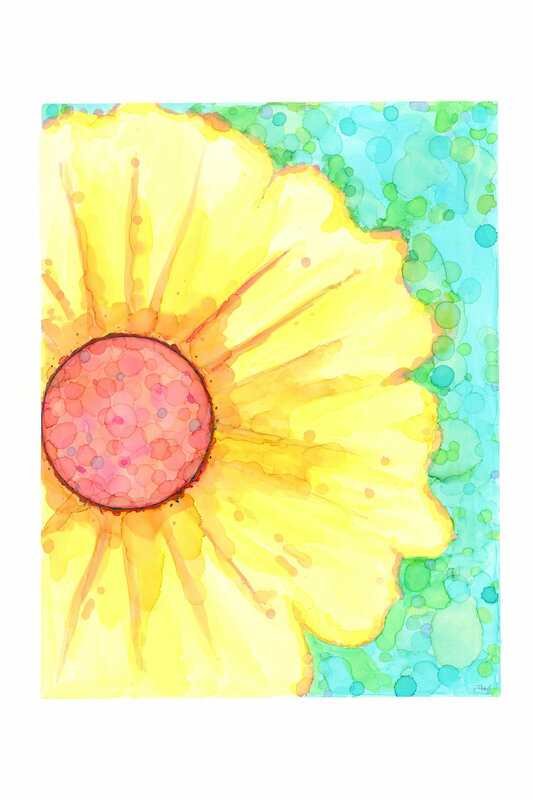 Images are available as original paintings as well as prints on paper or canvas. Some images are also reproduced on a variety of gift products. This series of artwork incorporates my love of vintage ephemera (paper) and our beautiful West Coast nature. In this series I hand-dye shapes made of vintage sheet music and old maps and embed them into the paint, as well as antique keys, baker’s twine and other found objects. creating an atmospheric silhouette. I created this series of art prints and giftware to celebrate our neighbourhoods and the places we love! Since I am based in the Lower Mainland of Vancouver, I have designed ‘Street Name Prints’ for these areas but have begun expanding into many Canadian cities. I can also create a custom print for you upon request. This series is also available as “tourist gifts” in many local shops. For more than 15 years I have bought and sold antiques. 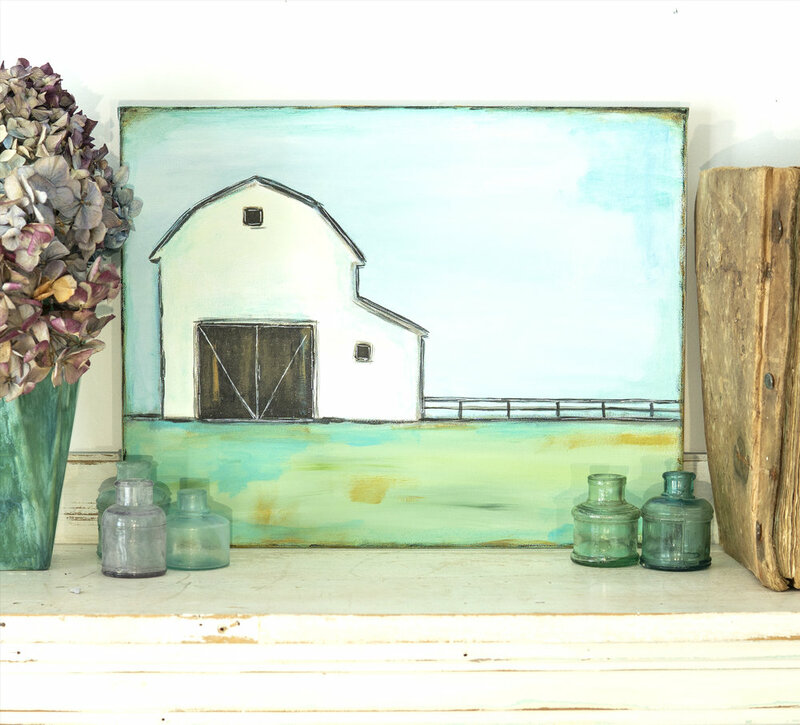 Everything from rusty farmhouse finds to delicate old papers. I am inspired by the mysteries and beauty of old things, especially old photos and ephemera which have so many stories to tell. And my collection of vintage records is my greatest love - from early Canadian bluegrass to 60’s Bossonova records. Follow me on Instagram to view my latest finds, or check my Events page to find me at a local antique market. Sign up to my Newsletter to find out about a new vintage online shop and blog in 2019. I am excited to be able to contribute to the fundraising efforts of the White Rock Youth Ambassadors, White Rock Museum & Archives & the City of White Rock to rebuild our beloved White Rock pier. My original painting “Family Day At The White Rock Pier” has been donated to their local History and Art Exhibition at the Landmark Pop-UpTown Gallery in White Rock! I am also going to donate 10% of sales of the print in my Etsy Shop - so please check it out if you want to purchase a copy! 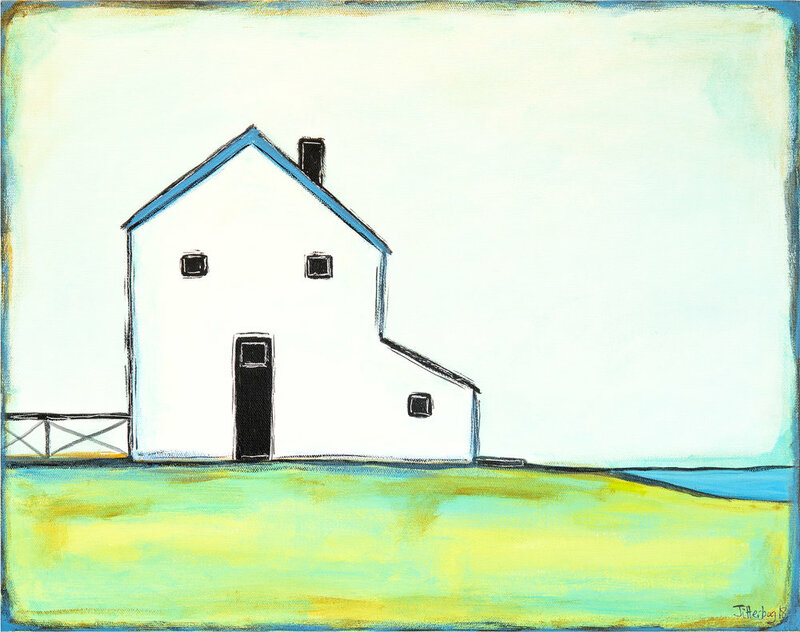 I am a mixed media artist, working in a whimsical, naive folk-art inspired style. 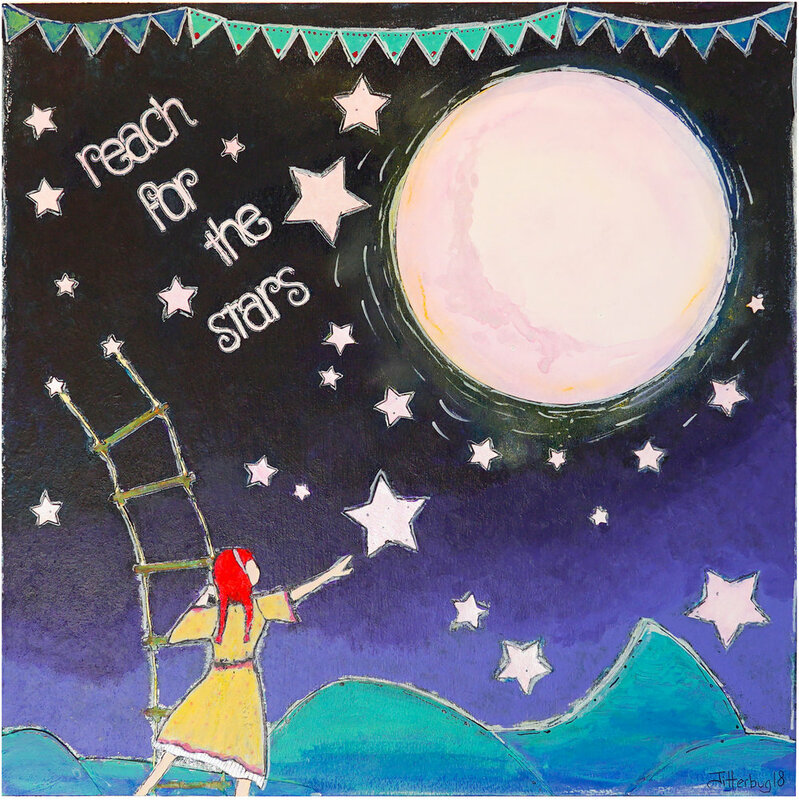 My work is available as original paintings and prints and also on a variety of giftware including Greeting Cards, Magnets, Bookmarks, Notebooks and more. My beachside garden studio overlooks the waters of White Rock, B.C. 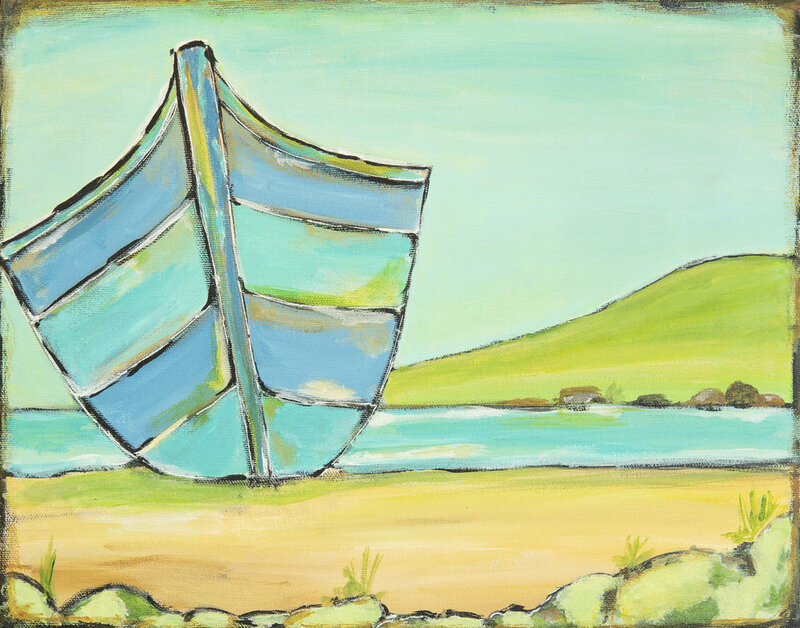 Canada, so my paintings are often inspired by nature and the ocean. My work is available through this website, my Etsy shops, and in select retail outlets. Throughout the year I attend many arts & craft markets so please check out my Events page or follow me on social media to find out where I am going next. I mostly work in acrylics, but over the years I have worked in other mediums, including Watercolours, Alcohol Inks, & Mixed Media. You can browse a few samples here. Follow me on Social Media to learn about my new works and my upcoming markets. 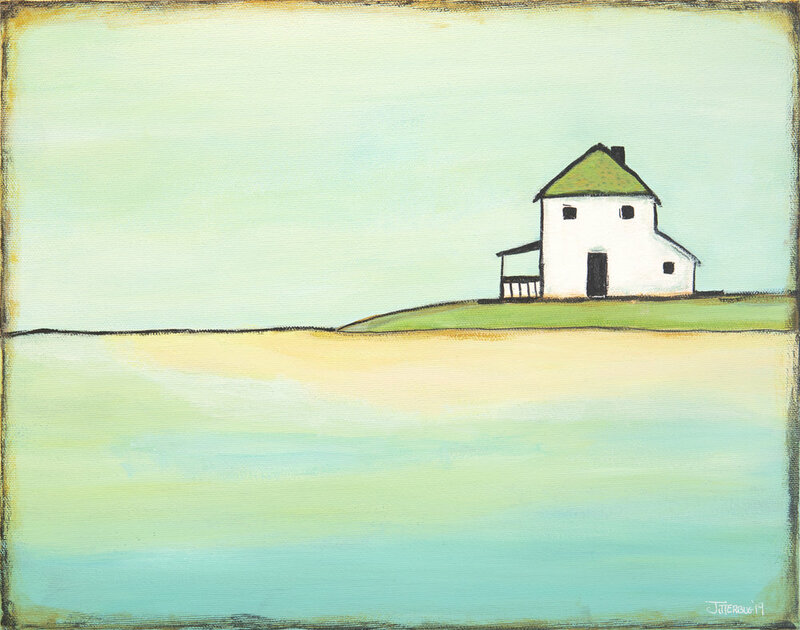 These whimsical, folk-art style paintings use elemental forms, colour & texture to create sweet but beautiful scenes. I make them using layers of vintage sheet music & maps that I cut into shapes and dye by hand using a combination of inks and paint. I also incorporate antique skeleton keys, bits of wood, bakers twine & other found objects. Each piece is one of a kind, but I do paint them in series, so you can create groupings on your wall. Each comes with a signed authenticity card, and the 6”x8” artwork each come with a nice white gift box to make your gift-giving easier. Come see them in person at one of my upcoming markets or in select retail locations. Please follow me on Instagram to see my latest artwork for sale, or contact me to inquire about a particular painting. This popular series of Art Prints celebrates local communities around the Vancouver area and across the Country. It is sold in gift shops, in my Etsy shop and through this website. I offer custom options where you can add your own streets or have a larger size print made, so find out how easy it is for me create one for you. This popular series of Art Prints celebrates local communities around the Vancouver area with beautiful graphic images. You can find them in select Gift Shops, in my Etsy shop, or through this website. I offer custom options, so ask me about how to order a larger size or how to have the image printed onto gift products. The year of 2019 is going to be a busy market year! So far I have started filling in the dates, with more to come soon. Check on my Events page for more details!